Volunteering for a “shift” is easy and fun to do. Typically “shifts” only take less than an hour and you get to meet some of the most generous and grateful people. Don’t have a car or want to help in a different way? E-mail us and we will apply your skills in other ways to help feed those in need in our community. We have been able to continue our work thanks in part to grants from these foundations. We could not help feed those in need without support from the community! 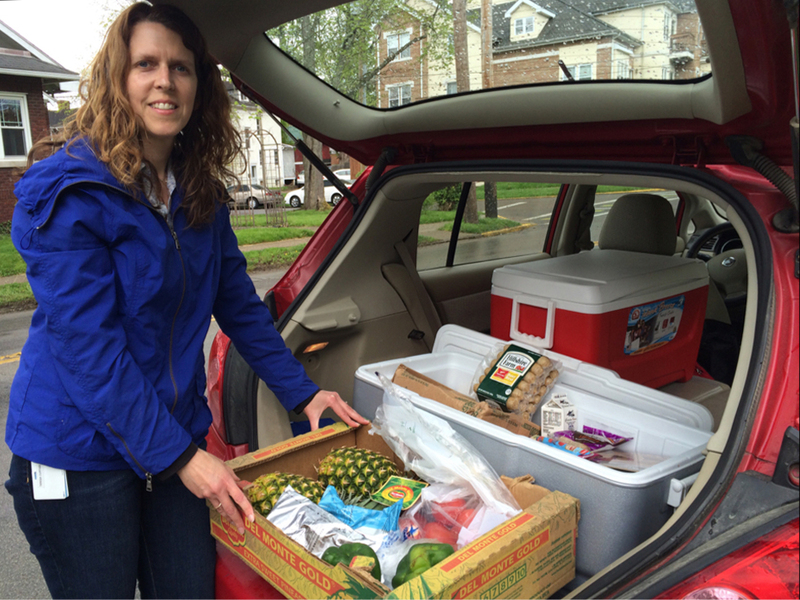 Selecting the Athens Food Rescue Volunteer of the Month for March was a no-brainer. It’s Teresa Curtiss, and the reason she was picked is that she’s just been named the winner of the 2019 Women of Appalachia Project Appalachian Advocate Award. “The award is given yearly to a woman who has dedicated herself to enhancing the well-being of Appalachian culture, Appalachian women’s health, Appalachian families or Appalachian land issues,” according to a news release. Curtiss is one of the founders of Athens Food Rescue. The group of volunteers picks up excess food from area restaurants and other sources and redistributes it to feed hundreds of people in need, including residents of Athens’ homeless and domestic-violence shelters. To learn more about AFR, visit the group’s website – www.athensfoodrescue.com or check-out the group’s Facebook page. Curtiss will receive her award from WOAP on March 23, during the organization’s 10th Anniversary Gala at Ohio University’s Multicultural Center Art Gallery. The gala will also include a juried presentation of poetry, story and song, showcasing 20 Appalachian spoken-word women artists from seven states throughout Appalachia and 35 WOAP visual fine artists. Why participate in food rescue?